Definition: The Buzz Marketing is the practice of creating an excitement among the users and the consumers about a particular product, service, brand or the company. It is one of the forms of Word- of-Mouth, wherein the users give a buzz i.e. create a hype among the consumers about a product or service they have recently experienced. The Buzz can be both online and off- line, i.e. face to face communication without any medium. Friends meeting in a marketplace and discussing the latest movie can be the example of off-line buzz marketing. The social media marketing plays a dominant role in creating a buzz worldwide. The social media sites viz. Facebook, Twitter, Google+, etc. provides a platform for the companies and the users to meet and discuss the company’s whereabouts. Generally, the buzz is created for Movies, Gadgets, Sports, Events, Cars, Bikes, cosmetics, etc. The Buzz that creates a favorable brand impression called as the Outrageous. The Hilarious Buzz that can keep the brand in talks for its comic side. The Remarkable Buzz, to give remarks to the brand. The Secret Buzz to create a sense of suspicion. 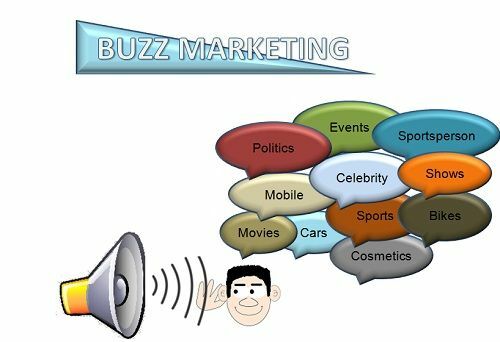 The “Buzz” is the sound created by the “Bees” and similarly in buzz marketing, the group of people is considered as “vectors” who create the buzz about the brand or a company. The Lunatic Fringe: Also called as “Innovators,” who are open-minded and always ready to try the new products and services launched in the market. Alphas: These users lie between the innovators and the early adopters, who search in for the novice products and ready to bear the risk. Bees: These users give birth to the buzz marketing, who regularly share their experiences about the goods and services with the other consumers. Large public: It includes those users who buy the goods and services only when it has been used by the majority of the population and is well tried and tested.There more than 150 users who share their experiences with the consumers, but it has a Snowball Effect i.e. less information fades naturally. Laggards: These users are traditionally bound with the conservative mindsets. They do not resort to the new goods and services immediately and wait for a long time till it becomes a tradition. Typically, the buzz marketing is triggered by the “Influencers”, i.e. Early Adopters, who wait eagerly for any new things to come into the market so that they can share their views about it with their friends, family, peers, and colleagues.